The Long Version: In addition to running sound and lights for a rock band and a country music group, I'm also the bassist for a progressive rock band called Televators, and we're working on our debut CD. When I started playing guitar in the '70s, you could tune with a pitch pipe, a tuning fork, some dude's piano, or spend over $500 on a Conn or Petersen strobe-based tuner. All bad choices for a kid just trying to play in-tune with his garage band. Luckily, cheaper electronic units came out around 1980, but they weren't very good, nor cheap enough. The situation is much better today. Tuning is critical when money is on the line. While pouring dollars out a hose to record in a professional studio in April I used a rack-mounted Korg that's long been a favorite of professionals. The wide display that sweeps left-to-right and back again while you're playing earned this model the nickname "Cylon". It was great, but kinda pricey and I think it's been discontinued although other rack tuners are still available. For our live shows I kept getting lucky in that the amp rigs I was borrowing all had similar units, but as I've been building my own system the need arose to finally buy my own. And suddenly I had two! The pedal style tuner on the right is one I ordered from B&H in NYC. It's got all the features I'll never need just like most of the other brands out there, but at a much nicer price. Think 75% less, which is how I like to shop. 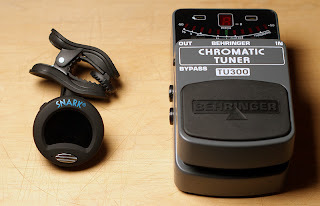 Behringer gets a bad rep sometimes because their very affordable gear, while based on excellent German designs, is made in China to meet the lowest possible price-point and tends to fail when subjected to rigorous touring conditions. My experience mirrors many online reports, so I just try not to let clumsy roadies carry any of the company's products, and never use them in critical show-ending parts of the audio chain unless I have a spare with me. But even when considered slightly disposable, I like the results of many Behringer products. "Don't drop your toys or they'll break" was good advice when I was 4, and it still makes sense. Plastic body shell and hinge points, not various metals like the competitor's $90+ offerings. Don't stomp on it = No problem. Other online reviews of this tuner mention that it's a little slow to respond on the very lowest notes of 5+ string bass guitars. My testing agrees, but since Televators only go down to drop-D tuning it hasn't been an issue for me. Still, this can be a deal-breaker for bassists in a big hurry. You don't get an AC adapter (wall-wart) for $25, but it uses the same plug, voltage, and polarity as most other pedals so chances are you have a spare. I had three. It's a great tuner for the price, but I'll admit that it's a bit tricky to change 9-volt batteries if you want to power it that way. Nothing to plug in, works on acoustic as well as electric instruments, and it's tiny. The going price online is usually under $20. When playing live I dislike having anything hitching a ride on my bass for both aesthetic and practical reasons, and to use the Snark between songs it's necessary to turn your guitar off so nobody has to listen to the annoying sound of a musician tuning up for however long it might take. Pedal tuners like my Behringer mute the sound while tuning with a simple tap of your foot, and I love that convenience. But the Snark has it's good points, for sure. It's surprisingly quick at picking up your note and displaying results--faster than the Behringer and the Korg Cylon and pretty much every other tuner I've used during the past 30+ years. The display looks great under the usual lighting conditions, although I still haven't tried it in direct sunlight--no foreseeable need to. It's tiny and light and runs off a standard CR2032 button cell. Has a built-in metronome, apparently. For students I guess. The best part is that you don't have to plug into it, so ANY instrument to which it can be clamped is tunable with great precision. When I'm writing songs or learning covers it's usually in front of my PC with the speakers down low. No amplifier, just bare acoustic energy from my bass or guitar strings. 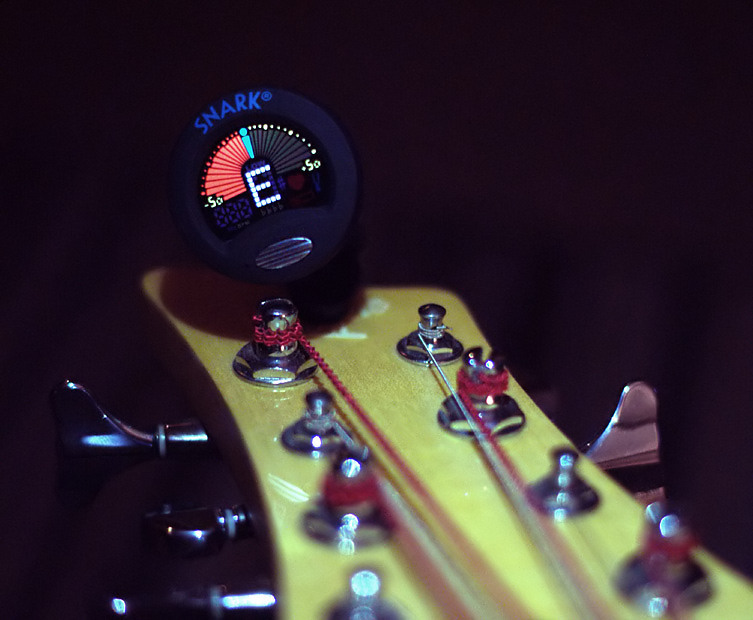 Having to plug into a tuner is a hassle, so the Snark is a real time saver. Same thing at band practice or in our ProTools studio. I also set-up other people's guitars and basses, adjusting the truss-rod and bridge so that they'll play nicely and in-tune all the way up the neck. Sometimes these instruments are waiting for electrical parts to arrive, so the Snark allows me to get work done ahead of time. The funny thing is that while playing with the Snark I clamped it onto my Black & Decker cordless drill, and I'll be damned if it didn't track the RPMs accurately! My brother is pretty excited about this, because all it takes is a note-to-Hz-to rpm conversion chart to be able to measure all kinds of motors and other things that vibrate, as long as the fundamental frequency or one of the major harmonics falls within the tuner's range and you have a good idea which octave you're dealing with. My Samsung Galaxy S phone vibrates a little above F.
Note added by Matthew: The Televators' first single, Milk Run, can be found on iTunes. For a second there, I thought Matthew Robertson was going to reveal his musician side of things. Then I read who the author was for this post. It has been a while since I played (just casually, though), but I think I will pick up my strat again and will most likely end up picking up the Snark tuner as well. I like the review, and I've listen to the preview on iTunes and I like what I hear. Best wishes on the debut CD as well.